We've been asked by some riders with bikes with flat handlebars if they should change to riser bars. The large majority of handlebars on mountain bikes are either 'riser' or 'flat'. On downhill and most longer travel bikes (140 mm or more of rear travel) riser bars are prevalent. However, on more racey, cross country style bikes, both riser and flat bars are common. In this article we'll examine the difference between the two bars and offer some insight into whether you should consider changing from flat bars to riser bars. For the purpose of the article, we will assume that the bike in any example given has a stem with little or no rise itself and is not overly short or long. More about stems and how they affect the bike/bars later. What is a 'flat' bar? A flat mtb handlebar is pretty as the title suggests; a flat handlebar that doesn't bend upward. Flat bars usually have a small amount of back sweep angle. Back sweep is a slight backward bend to provide a more comfortable grip angle for your hands than if it was flat/straight across the full length of the bar. A flat bar keeps your hand position down low and inline with your stem. On a bike built for outright racing, this low position puts you easily into a forward, racey body position for driving down on the pedals. It also provides a better position for standing up and sprinting. This low and forward position also pushes weight onto your hands and into your front wheel for traction. Note: It should be noted that much of this can be achieved with risers bars by adjusting your riding technique. On the right bike, set up correctly for the rider, a flat bar may offer no disadvantage whatsoever. However, for many riders, the more forward position and subsequent weight on the hands and wrists can be a source of numbness or pain on longer rides. The forward weight also inhibits the rider from pulling the front wheel up, more so than when using a riser bar. What is a 'riser' bar? A riser mtb bar is again described in it's title as it rises upward on each side. Riser bars, like flat bars, also include a backward sweep angle of around 7 - 9 degrees, but they also have upward bends to place the grip positions higher than the level of where the stem clamps to the bar. Riser bars usually come in rises between 10 - 40 mm. By choosing the amount of rise you want in a riser bar, you can tailor several facets of your bike's handling characteristics and comfort. If you loosen the stem clamp and roll the riser bar a little, the combination of rise and back sweep lifts or lowers, and rolls the bar grips forward or back a little. This allows a little adjustment to be made to suit your personal taste or even accommodate an injury or condition you may be riding with. Probably the main advantage however, comes from lifting your hands to a higher position. This takes some weight off your hands in your relaxed/neutral riding position and, combined with the higher position makes it easier to lift the front wheel to get over obstacles etc. This is an advantage for keeping your weight back and still being to get some lift from the front wheel when you need, especially when the bike is pointing downwards. Like any change/comparison in mountain biking, each advantage gained is usually accompanied with a disadvantage as well. Less weight on your hands means less weight over your front wheel, in turn pushing your tyres into the trail less and producing less traction. A more aggressive body position changes are required to regain the front end traction. Also, a lighter front end and higher grip position will also encourage more front wheel lift on steep climbs. Again, a more aggressive body position is required to resolve this. Remember to always consider your bike setup when changing bars. If you want the most efficient power transfer when seated for fire roads and climbs, then your saddle height should not be comprised. Changing your bars from flat to riser (or vice versa) alters your reach distance a little. Reach is basically how far you have reach forward to hold your bars. Your bar height is also changed unless you compensate with stem adjustments. You may or may not need to raise or lower your stem height to keep within the recommended levels. You may even need to change your stem. As a rule of thumb, we usually recommend having your bar grips around level with your saddle and no more than 30 - 50 mm above. Level with your saddle is more racey and higher is more relaxed and downhill orientated. 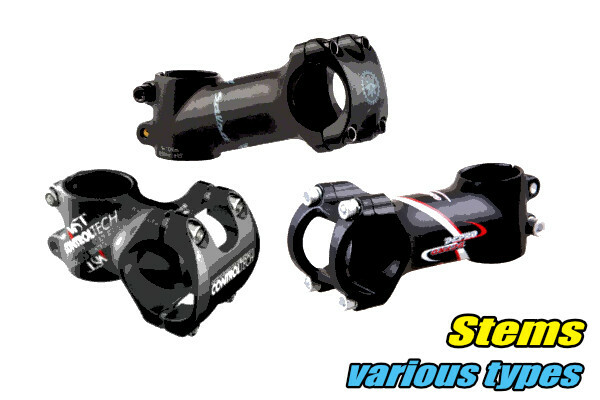 Stems come in a variety of rises also, and are usually fitted to your fork steerer tube with several spacers. This allows you to further adjust your bar grip height by moving the stem up or down by repositioning the spacers. Switching to a stem with more rise angle and/or length, further enables adjustment to attain or retain the required height. Obviously however, shorter stems can offer much less rise than longer stems. Stems also come in different lengths, typically from as short as 35 mm through to around 130 mm. The actual length stem on any given bike depends greatly on the geometry of the frame. The changes in geometry for many mountain bikes these days, sees the bikes sold from new with very short stems. By reducing your reach in this way, the front end becomes more responsive to lifting when you need it to and reduces the arc your hands have to turn when steering, thereby speeding the steering action up. A short stem also allows you to get your weight over the front better than a long stem does where needed also. However, when you are wanting to really stretch out and power along those gravel roads, bike paths or even up mild climbs, a longer stem is likely an advantage. A shorter stem may encourage unwanted front wheel lift when you are struggling up a steep climb also, so again, a more aggressive, forward body position is required. Confused yet? Don't worry, we won't go into stack heights, head angles, chainstay lengths and other factors that influence the stem length decision made by the bike's manufacturer. Suffice it to say, stems are an integral part of the handlebar system, and where possible, can be adjusted to get your handlebar grips where you need. Let's simplify things down again and look at if you really need to change your flat bars to riser bars at all. After all, if you are on the right size bike that is set up correctly for you, and it is the right type of bike for your riding, then it's likely things are fairly close to where you need them. Unless of course you have a unique physical reason to need a significant change. Either way, getting a professional bike fit is a good place to start. The issue you are having might just be a poor bike setup. The key here is that your hands, when gripping your bar grips, are in the right position. No point changing bars if that isn't rectified by doing so. Do you feel as though you have too much weight on your hands? Or feel like you are falling forward even when riding on flat trails? Assuming your saddle height is correct and the saddle isn't tilted too far forward/down then your stem may simply be set too low on the steerer tube. Trying raising them by shifting the stem above any spacers where possible. If you can't raise the bars any higher with this method, then perhaps a riser bar may be the answer. No matter what you do, even after coaching lessons, do you struggle to get the front wheel to lighten or lift over obstacles on the trails? Assuming your technique is ok, you may be finding that because your flat bars are keeping your hand position in line with your stem, the forward body position and subsequent weight on the bars is a bit much for you. Imagine if the bars were down near the wheel. You'd probably never get the front wheel off the ground. Imagine if the bars were up level with your chest. You'd be popping the front wheel up even when you didn't want to. By changing to a riser bar, and thereby raising your grip position 20 mm or so, you increase the leverage needed to lighten and lift the front wheel. Are lifting the front wheel, steep descents and drops a large part of what you do on the trails you usually ride or often required in the type of races you do? The point here is, why make a change to your bike if you hardly ever need it? One reason you may answer "yes" to that is if it's a safety thing. 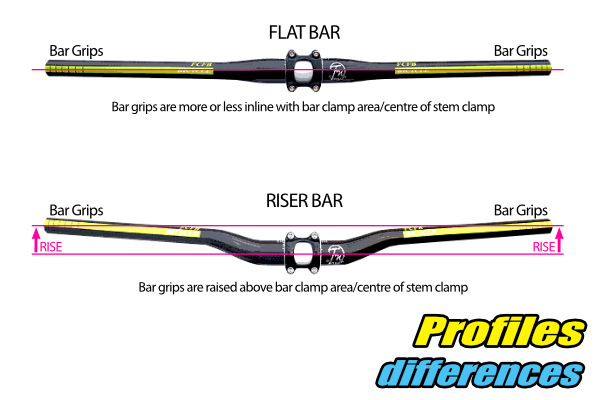 If you feel you are going to be more comfortable and safe by switching to a riser bar, then perhaps it's a good move even if it's only a smaller percentage of your riding that really requires it. To summarise, it's imperative that your bike setup is correct before you go making any major changes to your bike. Actual handlebar grip height and reach in relation to the correct saddle height is far more important than whether you have flat or riser bars. Change your stem and/or fit riser bars to get the correct bar grip position to get the best bike setup, not because someone tells you risers are better than flat bars.